Nearly six months before Alberta Health gave a private health foundation a $10-million grant, public health dietitians warned Alberta Health Services about a serious potential health risk they believed could have been caused by the foundation’s lax distribution of high-dose supplements at the Calgary Drop-In Centre. Nearly six months before Alberta Health gave a private health foundation a $10-million grant, public health dietitians warned Alberta Health Services about a serious potential health risk they believed could have been caused by the foundation's lax distribution of high-dose supplements at the Calgary Drop-In Centre. INTERACTIVE: Private Health, Public Risk? 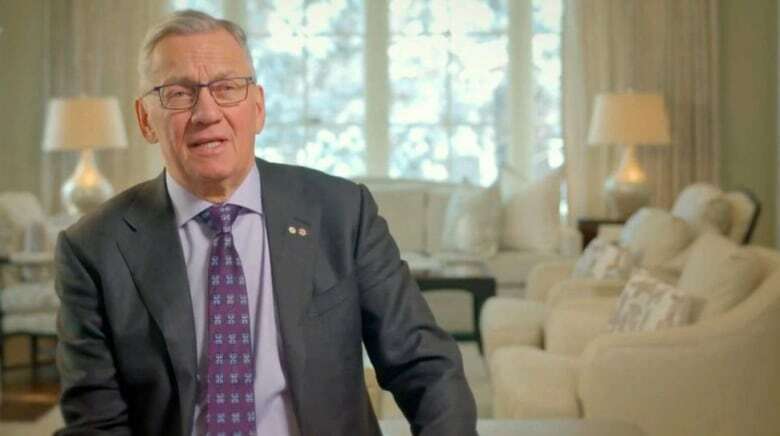 The dietitians also warned senior Alberta Health Services (AHS) officials generally about potential health safety risks related to the unproven alternative-health program offered by the Pure North S'Energy Foundation of Calgary, the private foundation of former Canadian Natural Resources Ltd. chairman and Calgary Flames part-owner Allan Markin. "Pure North S'Energy is providing these free programs to vulnerable populations such as homeless individuals and senior citizens with limited financial means and who may not have the ability to properly assess the safety of programs being offered," the dietitians wrote in a report circulated to senior AHS officials in early July 2013. Internal government documents obtained by CBC News contain no reference to AHS acting on these warnings. Nor, it appears, did AHS communicate the dietitians' findings to Alberta Health, the ministry which funds the health authority. 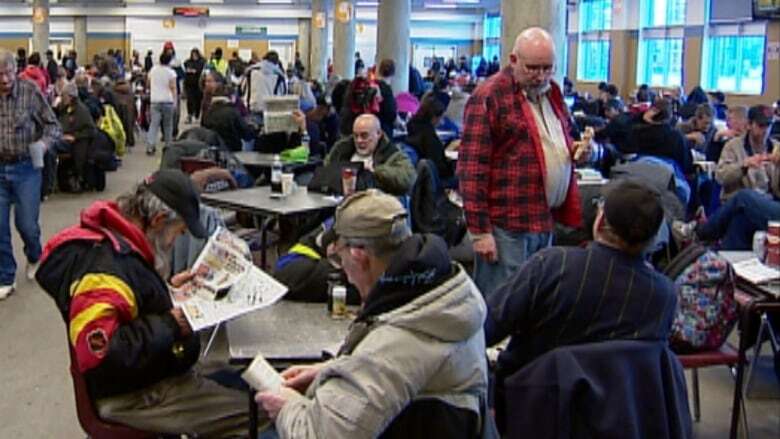 Alberta Health Services did not directly respond to repeated requests for information from CBC News about what, if anything, it did about the health risks identified by its staff at the homeless shelter. In an interview, Pure North spokesperson Stephen Carter said the foundation was not told about the issue and had no knowledge of it. "We have completed a thorough search of our records," Carter told CBC News in a subsequent letter. He said someone would have contacted the foundation if the issue "was deemed to be of concern." Despite the concerns of public health officials, Pure North has always pointed to research studies it says show the program is safe and effective. In December 2013, nearly six months after dietitians reported the potential health safety risks, Alberta Health gave Pure North a $10-million grant to further expand an existing program, which was ultimately offered to more than 7,300 Alberta seniors. Pure North is a privately run, non-profit foundation that offers an alternative health program involving high doses of supplements, particularly vitamin D. It offers the program at no cost to vulnerable populations such as the homeless, addicted and elderly and for years has delivered its program at various outreach organizations. Internal documents show that on July 2, 2013, Nutrition Services executive director Carlota Basualdo circulated the dietitians' report about Pure North to AHS colleagues. The dietitians, unnamed in the documents, said they had been approached by provincial health nurses at the Drop-in Centre who had noticed fluctuating INR (International Normalized Ratio) results in the blood tests of clients. INR is a measure of the blood's ability to clot. They wondered if the fluctuating INR results were caused by "large and inconsistent amounts of vitamins and minerals" being distributed by Pure North at the drop-in centre. They suspected the fluctuating results may be linked to Pure North's distribution of vitamin K, which can affect INR. Fluctuating INR results can be dangerous in individuals who are at risk of heart attack or stroke because it can make it difficult for a treating physician to regulate the blood's clotting level using drugs such as Warfarin. Too much Warfarin can cause uncontrolled bleeding; too little could result in a heart attack or stroke. Basualdo's email included a "summary of concerns" prepared by the dietitians, who had conducted an investigation into the supplements, their doses, and how Pure North was distributing them to clients. Generally, Basualdo said there was concern about "the non-evidence based practice of providing megadoses of vitamins and minerals" above Health Canada's recommended levels, and "the potential adverse effects (fluctuating INR levels due to vitamin K intake)." The investigation revealed packets of vitamins and minerals, enclosed in a plastic "cellopack," were being distributed daily from a large cardboard box before and after meal times. "These boxes are often minimally supervised by volunteer staff and individuals have been encouraged to take several packages, to assist with their health," the summary states. While it is a breach of Health Canada regulations to distribute unlabelled supplements, the summary says: "Each supplement in the package is found unlabelled with no specific instructions on how to take them." 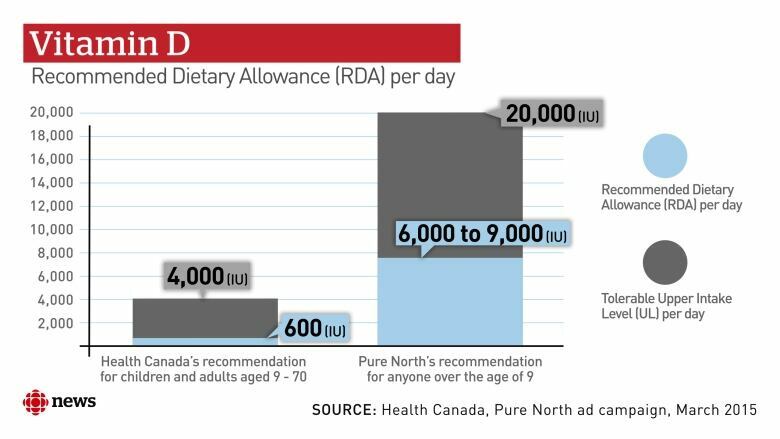 The dietitians were particularly concerned about Pure North's distribution of high-dose supplements that in some cases far exceeded both Health Canada's recommended dietary allowance (RDA) levels and safe tolerable upper intake levels (UL). Some supplements were several thousand per cent above RDA levels and some were several hundred per cent above the upper level. For example, the dietitians discovered Pure North, based on a doctor's written protocol, could have given some clients a vitamin D dose of 50,000 international units (IU) every two days for six days, and then 10,000 IU daily for two months. Health Canada's recommended dietary allowance is 600 to 800 IU and its safe tolerable upper intake level is 4,000 IU. The dietitians noted a number of health issues that can be caused by excessive doses of vitamin D, including "kidney dysfunction, excess calcium in the urine, soft tissue calcification leading to increased cardiovascular risk," as well as an increased risk of fractures and falls in the elderly. Basualdo sought input from Jeffrey Johnson, scientific director for the AHS Diabetes, Obesity and Nutrition Strategic Clinical Network. "I think we may need to prepare for some fallout from this story," Johnson said in an email. "I could imagine some potential malpractice issues, if prescribing high-dose, off-label vitamins and supplements that are negatively affecting patients' health, such as interfering with INR," Johnson wrote. "The evidence base for this is all very weak and speculative in the first place." Basualdo also sought input from Dr. Alun Edwards, senior medical director of the same clinical network as Johnson. "The potential harm issue would be critical and the issue highlighted of variable INR could have very serious health consequences," Edwards said in an email response to Basualdo. "Vitamin K would be the culprit here." But another AHS official warned about a potential backlash if they clamped down on Pure North's distribution of supplements. "Not sure what our purview is in 'drop-in centres' but agree it raises a public health concern," wrote Dr. Leah Gramlich, the provincial medical adviser for nutrition and food services within AHS. "The flip side is that we might be perceived as the big bad AHS if we remove 'free samples' of multivitamins from a drop-in centre that supports the socially disenfranchised." 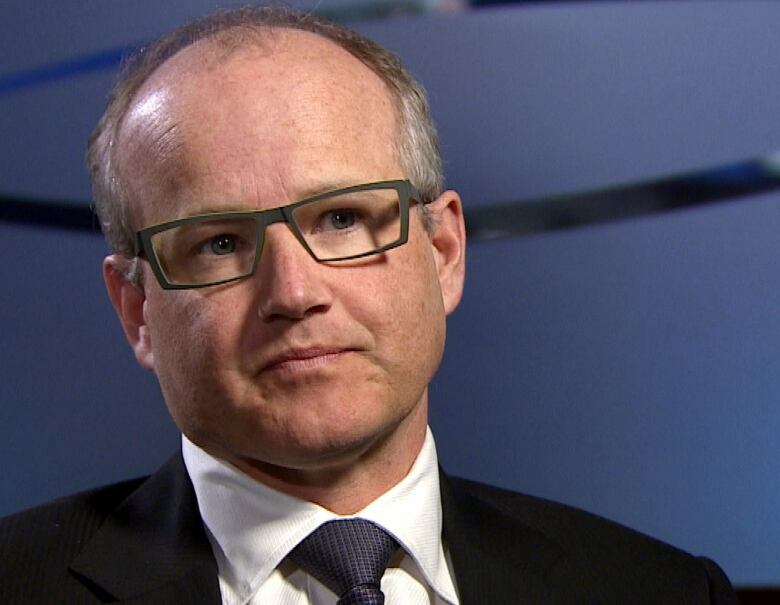 There is no mention among thousands of pages of internal government documents of any further action being taken by AHS or Alberta Health about the safety issue. Jayne Thirsk, director of the Dietitians of Canada, said Alberta health officials need to scrutinize the Pure North program. 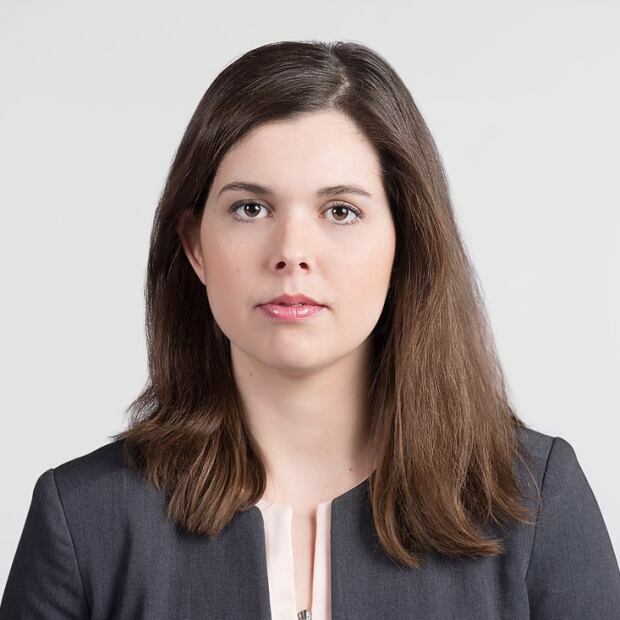 "I think as more people become aware of some of the deficiencies in this program and some of the risks in this program, you will see people stepping up and challenging it more and hopefully putting a stop to it," she said.